1981. Written and directed by Jan Egleson. With Laura Harrington, Henry Tomaszewski, Michele Greene, Lance Henriksen, Pamela Payton-Wright, Albert Eaton and Terence Grey. Cinematography by D’Arcy Marsh. TWO YEARS AFTER BRINGING grass-roots fiction filmmaking to Greater Boston with Billy in the Lowlands, Theater Company of Boston vet Jan Egleson returned to the streets of Cambridge for another life-sized drama. Billy Shaughnessy (Henry Tomaszewski), whom we left trying to right his life after legal troubles in Billy, is back in The Dark End of the Street (like its predecessor, named for a song). In the followup, vulnerable Billy’s need to steer clear of the law is again a big factor, but he’s not the main focus. Girlfriend Donna (Laura Harrington) is. The intrigue begins after some post-softball partying on a roof in the Cambridge projects where they live. Billy and Donna hang around so they can be alone, but they’re joined by Ethan (Terence Grey), a drunk friend who teases them, horses around a bit and then falls from the roof. The couple doesn’t tell the police for two reasons. One is Billy’s probation; he’s sure any hint of wrongdoing will land him back in juvenile prison (it’s an inside joke when he says, “I’ll be in Billerica until I’m 90,” a line he first utters in Billy in the Lowlands). The other is the fact that Ethan is black, and Donna and Billy are not. The chance of a race-related crime will surely make the police aggressively investigate the incident. As with Billy in the Lowlands, the filmmaking in The Dark End of the Street is basic, and the dialogue sometimes flat, particularly in the big speeches by the detective (Gustave Johnson) investigating Ethan’s death. But the pleasure of the movie is in the intimate world it etches out, not just the plot. In a less intimate movie, the race question would swell into big crowd scenes with angry project residents and police barricades, and Donna and Marlene’s friendship might get lost in the shuffle. Similarly, the scenes with Donna’s weary mom, who’s so well-played by Payton-Wright, wouldn’t make the cut, since they don’t often advance the central plot. 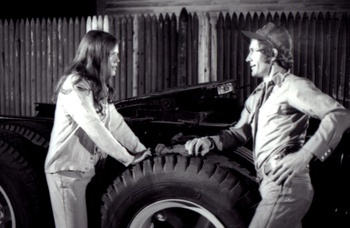 Straddling the plot and the more observational scenes is Jimmy, the exotic truck driver and the mom’s boyfriend, played with flippant charisma by Lance Henriksen, who’d worked in Boston theater and later scored in such cool movies as Near Dark and Stone Cold (he's in the photo below, with Payton-Wright). The Dark End of the Street doesn’t deliver a knockout the way bigger movies sometimes can, but it portrays the delicate balance of everyday life in ways most movies overlook. The world doesn’t change much over the course of its action. Life is just as much of a struggle for its characters as it was before, and the earthy characters (many played by non-professionals) remain in the same station in life. Since Hollywood was turning away from its uncharacteristic 1970s adventurousness, this and Egleson’s other Boston movies were a welcome departure from the crush of sequels, remakes and save-the-world escapism. Unlike the on-the-run plot of much of Billy in the Lowlands, The Dark End of the Street sticks closer to home: the most prominent Cambridge locations are where the characters live and work, including the Roosevelt Tower projects and Sexton Can (formerly in East Cambridge). The donut shop where Donna works is Linda’s, over the line in Belmont. We also see Flapper’s, a one-time club where Alewife Station now stands, as well as the old Howard Johnson’s off the expressway in South Bay and the Quincy quarries. ►Locations: Cambridge; Belmont; Dorchester, Boston; Quincy. ►Accents: Unlike most of the young cast, Laura Harrington is not from the projects. But the former B.U. student does a great job of blending in with her fellow actors. As with Billy in the Lowlands, the genuine accents are part of the deep credibility of the movie. ►Local color: With its plot in which characters try to get through their daily lives, the color is more class-based than geographical. Just about everything we see is related to work, home or play—where Billy and Donna work, where she lives, where they hang out. This is working-class life shown with no desire to glorify it or gloss up its bleakness. And considering that much of it is in East Cambridge before it changed from an industrial area to a high-tech area, this is working-class life from a specific time. ►Don’t blink! : Yup, that’s little Ben Affleck making his movie debut in the silent role of Donna’s brother Tommy. I saw this years ago at Harvard Film Archive. At that time, I thought the director said it was shot at Jefferson Park housing project in North Cambridge, rather than Roosevelt Tower. Maybe I'm confused? I interviewed Jan Egleson about locations, so I'm confused, too. Chances are they shot some at both projects. I am desperatley trying to obtain a copy of this movie, does anyone have any suggestions on how to do that ? I can't find it anywhere !!! Hi. I was an actor in all three of Jan's working class "trilogy" of films. The Dark End of the Street was indeed shot in Jefferson Park, not the Towers, I know because I was there and I also grew up in Jefferson Park. Sexton Can was actually off of Revere Beach Parkway in Everett and was owned by a friend of one of the producers. If anyone wants a copy of the 3 films I have them on dvd. My email is: Garethtrue@gmail.com.